We decided to extend the point of that discussion on some of the most important trends the manufacturing industry faces as we enter 2014. Here are insights and responses from ten industry leaders on 2014 manufacturing trends. It’s a transitional year, with issues in talent development, the -re-shoring of manufacturing in some sectors, and the forward momentum of technology for manufacturers of all sizes. Our take from the recently released IDC Manufacturing Insights report was that it focused on two key points that seem to really stick out through repetition simply of the two words: Operations and Technology. We have written extensively on how investments in improved operations and technology are great ways to improve manufacturer and industrial distribution companies’ bottom lines. Additionally, when a company outsources parts of the supply chain and logistics management side to an expert (or any outsourcing provider beyond the core competency of the company), it allows operations to come into focus as there is now time to allow the manufacturer or distributor to invest back into growing the business. Adam Robinson, Marketing Manager for Cerasis Inc, a freight logistics company and truckload freight broker. There are two major trends that will impact manufacturing in 2014: The lack of technical skills and a large number of process automation systems nearing end of life. As the baby-boomer generation accelerates its rate of retirement, many critical skills will be lost leaving manufacturers looking for solutions that include ramped-up training, stronger relationships with technical schools and outsourcing highly technical functions such as programing and production maintenance on the most complex manufacturing assets. Jeff Owens, President of Advanced Technology Services (ATS), a provider of IT managed services. The 1,200 American manufacturers responding to ThomasNet.com’s latest Industry Market Barometer survey on their growth and outlook are effusive in describing how technological advances are improving their companies and invigorating their work life. As a result, they are growing, hiring, and increasing their production capacity to meet future demand. These manufacturers say their employees, market leadership, technology, and innovation will help them continue to compete. Nearly seven out of ten (67 percent) will focus on introducing new or innovative products/services this year. [However], a closer look at our findings reveals a disconnect between the growth of these manufacturers, and their lack of urgency recruiting fresh talent to learn the business before older generations exit. Eight out of ten manufacturers report that Generation Y represents a small fraction of their workforce, and most don’t see this changing soon. The findings point to a need for a collective ‘succession plan’ for the manufacturing sector, starting yesterday. Eileen Markowitz, President of ThomasNet, which connects buyers and sellers in industry and manufacturing. Manufacturing speed will be critical in 2014. As supply chains become more advanced, manufactures need to keep up and develop innovative products quickly that are built to last. Gone are the days of unskilled employees and now employees need to focus on working effectively to drive innovation and generate new ideas. Michael Engel, Chief Operations Officer at FLEXcon, Inc, an innovator in adhesive coating and laminating. Joe Payne, Vice President of Professional Services and Diego De la Garza, a Project Manager work at Source One Management Services, LLC, a procurement service provider. In our Digital Fabrication business, one of the most important trends we’re seeing is the ability to integrate more and more 3D Printing technology with laser, CNC, hot embossing and other micro-manufacturing capabilities. Our 3D Systems production 3D Printers have evolved to a place that allows us to always pick the best tool for the job. Often any single tool does not give a complete solution to a problem. 3D Printing technology is a welcome addition to our manufacturing toolbox, as it increases the options we can offer our customers. We see this as a significant trend in our industry for 2014 and the future in general. Mike Adelstein, President and CEO of Potomac Photonics, Inc. of Baltimore, MD a contract manufacturing solutions provider. “In 2014, expect an accelerated focus on manufacturing technologies involving advanced composite materials such as carbon fiber, fiberglass and aramid. Manufacturers are calling for production technologies that facilitate their application of advanced composites. Further, economic initiatives at the local, state and federal levels including the National Science and Technology Council’s “National Strategic Plan for Advanced Manufacturing” reflect an emphasis on composites. Bill Wahlig, Executive Director and Interim President of the Long Island Forum for Technology, whose mission is to be the premier resource for technology-driven industrial growth through hands-on application of technology, know-how and the forging of strategic relationships. Accessible 4.0 for legacy assets – As any software user knows, a dot-zero release means pain, because you will be throwing away your existing platform and undertaking a major upgrade. That might be possible in the world of software, but it’s not going to work for the average manufacturer, who has infrastructure built up over decades. 2014 will see the hype of the Connected Factory becoming a reality for those who do not want to throw away their existing investment, as solutions are created to collect information from manufacturing assets, irrespective of age and irrespective of what type of control system they use. Mike Granby is currently President of Red Lion Controls, a global manufacturer of solutions for communication, monitoring and control for industrial automation and networking. Final thoughts – what’s next for manufacturers? 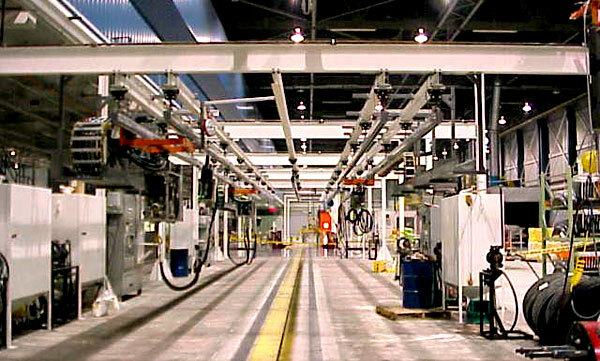 What important opportunities and initiatives does your manufacturing organization have in focus for the New Year? We would love to read your feedback and perspective via comments below.